The Drum Tech Drum Tuning System enables fast and easy drum tuning by eliminating the need to adjust tension rods. With the DTS, tuning is accomplished by adjusting the single DTS tension bolt. This one-touch approach allows you to listen to all aspects of the drum sound change while tuning. Most importantly, you can now bring the top and bottom heads into tune with each other to produce the best overall drum sound. The DTS adds a completely new level in creative control in fast pitch adjustment for playing style. The DTS retrofits to most hoop and tension rod-type acoustic drums and streamlines the tuning process. Once engaged, the DTS allows each drumhead's pitch to be raised or lowered via one adjustment while continuously maintaining even tension. The DTS eliminates the drudgery of conventional drum tuning and allows the drummer to quickly find the desired relationship between the top and bottom drumheads. The DTS approach uses bracket leverage, instead of rod turning, to raise and lower the hoop. The DTS cable goes around the hoop mounting onto each of the brackets. Increasing the cable's tension with the single DTS bolt increases bracket leverage between the tension rod heads and the hoop. This growing leverage applies a downward force on the hoop raising pitch. Loosening the cable's tension lowers pitch. No pre-tuning needed. The main reason tuning drums has been so difficult is because of the many tension rods around each drumhead that have to be individually adjusted. All of these rods need to be adjusted to approximately equal tension in order for the drumhead to have a clean tone. Large amounts of time are usually spent just trying to get these rods even. That is not tuning, that is equalizing. The act of tuning is normally the ability to change the pitch up or down, with one adjustment, while listening to find the desired pitch. What is not as commonly recognized is just how important the pitch is between the top and bottom heads. When the right tuning between the two heads is achieved, the drum will sing with a rich and full tone. Even with unequal tension between the individual tension rods, a drum will still have a rich tone if the top and bottom heads are in tune with each other. In order to find this precise tuning, the top head has to be struck while the bottom head (which only resonates) is brought into tune with the top head. The sweet spot between the heads is found by ear while sweeping the bottom head through its range (much like tuning a guitar). Unfortunately, this is practically impossible to do when manually tuning. By installing the DTS on the top and bottom heads of a drum, this precise head-to-head tuning can be achieved, and in just seconds. In fact, by installing the DTS on just the bottom head, the most difficult part of tuning is overcome. 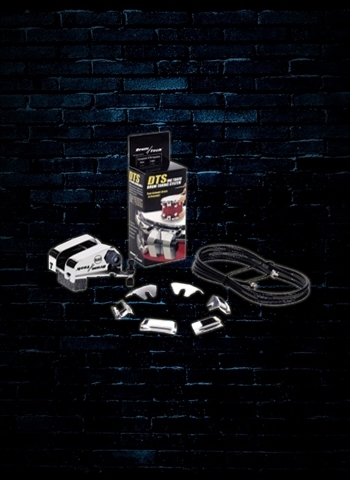 The DTS Advanced Drum Tuning System brings to drums a whole new approach to tuning. Most drummers either don't have the time or don't have the knowledge and experience to properly tune their drums. By adding the DTS to their drums, you can, with little effort, hear the way your drums were meant to sound. Spend more time plalying in tune and less time tuning to play.